It may have been a bleak period in human history, but the Second World War was a golden age for British cinema, as filmmakers discovered purpose and commitment in stories of resistance, fortitude and togetherness. 'An Education' director Lone Scherfig's witty, sophisticated and unexpectedly sober romcom pays tribute to those artists – writers, actors, directors, producers, even agents – and slips in a spry, timely investigation of women's roles in cinema for good measure. Catrin Cole (Gemma Arterton) comes to the attention of the Ministry of Information as a copywriter for newspaper cartoons. They're looking for someone to script a series of propaganda short films urging the women of Britain to work in factories and grow vegetables, and she's looking for a way to support her moody artist boyfriend Ellis (Jack Huston). But it's not long before Catrin is assisting writer Tom Buckley (Sam Claflin) on an inspirational feature film script inspired by a pair of Southend sisters who stole their father's boat and headed to Dunkirk to assist in the evacuation. The story is largely bunk, the Ministry brass are always lurking and washed-up leading man Ambrose Hilliard (Bill Nighy) is forever sticking his oar in. But Catrin and Buckley get stuck in, transforming this simple fable into a rousing tribute to everyday British pluck. 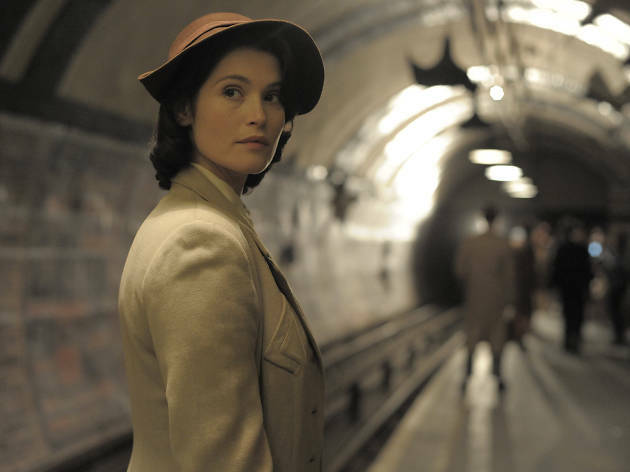 Like its film-within-a-film, 'Their Finest' might so easily have been sentimental hogwash, a jolly, stiff-upper-lipped love story set against the picturesque setting of London in the blitz: 'War, Actually'. But while she's thoroughly committed to serving both the rom and the com (the film is genuinely sweet, and at times very funny) Scherfig somehow never falls into any of the obvious traps. Catrin may be the archetypal spirited-gal-with-gumption, but Buckley is by no means her traditional romantic foil: he's prickly, chauvinistic and sometimes cruel, while still just about managing to retain our sympathy. Nighy's subplot starts out as light relief – the faded acting giant who can't believe he's no longer a matinee idol – but grows into something genuinely moving. And the war never becomes a backdrop: this London is cold and frightening, with death falling from the sky without warning. There's a little too much going on at times, and one awkwardly handled last-act shock throws things off balance. But the film claws its way back for a quiet but honestly earned finale, a reminder of the power of stories to make life worth living, even in the most brutal circumstances. It's hardly a new idea, but it bears repeating. I found this a thoroughly enjoyable and thought-provoking film. It's got a great cast with Gemma Arterton continuing her streak in characters championing the progression of women's rights through the ages. The storyline is woven around how the outbreak of war enabled many women to take on traditionally male roles and in so doing prove that they could be every bit as good as the men they were replacing. It's quite moving at times with the effects of the war being quite accurately portrayed and is a good watch overall. Another film rated as 4 stars by TO, which deserves little more than 1-to-2 stars. So bad I found it hard to stay awake. Set in WW2, The Finest was a story about women taking on typically 'male' jobs at the time, and excelling. Gemma Arteton becomes a scriptwriter, and works alongside Bill Nighy and Sam Calvin. It's a charming ,moving film, and Arteton is fab. 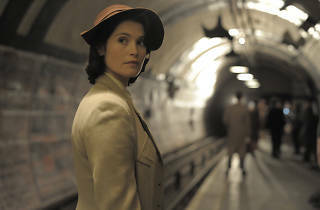 Set in the Second World War when men are scarce and jobs need to be done, Gemma Arterton,(Catrin Cole), lands the position of film scriptwriter. She turns out to be the bees' knees. Bill Nighy is very Bill Nighy, as watchable as ever. He is the actor within the actor which we see at the same time as watching snatches of the film within the film. Sam Calvin plays his character well- screenwriter/ seeing from male perspective/ timetaken to understand a situation. It is Welsh Catrin who highlights the power of the female but she has to fight her corner. A lovely film. Their Finest was a great watch with a killer cast. Bill Nighy was fantastic, though playing a similar character to what Bill Nighy always played... The concept was wonderful and original enough to keep you interested while covering known territory. It has enough turns to keep you invested and while its not the greatest film of all time, it's incredibly watchable and joyful. The film looks at the making of British Cinema during the propaganda years of the 2nd world war, in a light hearted way. It's a lot of fun, and an enjoyable project. It also aims a few neat swipes at the sexist attitude towards women in the film industry during this time. Gemma Arterton is perfect, & Bill Nighy provides a lot of laughs. I absolutely loved this film - although I do tend to say this about any Sam Claflin film. It had the right balance of female empowerment with heartfelt moments, humour and romance. The air raid scenes are honest without being too graphic and you get a real feel for what it was like living in London during WW2 - especially for women. Gemma Arterton is very inspiring and Bill Nighy is fantastic, he brings obnoxious humour to every scene. I’d highly recommend this film but, if you’re weeper, bring some tissues! This is a solid British period drama but don't go expecting a warm feel-good rose tinted reminisce about the Blitz. Yes Gemma Arterton is her warm & charming best & Bill Nighy dutifully provides the laughs as a deluded & narcissistic actor but at times the plot almost has a Game of Thrones-esque ability to kill off a leading character! I both laughed & shed a tear. The acting is faultless & the period detail is spot on- a quality production. Heartfelt film with amazing performances. The type of movie that leaves you engaged from start to finish.